The first aeroplane to visit Swindon arrived 105 years ago this week - 27 July 1912 - and attracted a crowd of 35,000 amazed onlookers. A Bleriot monoplane if you were wondering. Few of those could have imagined that, just a generation later, Swindon folk would find themselves building, modifying, testing, repairing and servicing planes of all shapes and sizes as part of an industry which would help to shape history. One locally built plane would even go on to briefly reclaim for the area the world speed record. Swindon and its neighbouring villages was the hub of a hastily-assembled aircraft industry spread over a number of sites which appeared as if by magic during the Second World War, before disappearing - although not quite as quickly - to leave only a few signposts to a remarkable period in the town's history. But it's a chapter from Swindon's story which deserves comparison with - and in many ways is connected to - its railway legacy. Aircraft manufacture in the area was first mooted in 1936 when the Air Ministry, with one eye on Germany's re-armament, started to make plans for 'shadow' sites which would provide back-up to the country's leading aircraft factories should they be attacked - and even substitute for them, if they were put out of action. By 1938, with war seemingly inevitable, South Marston was chosen as a shadow site because of its good communication links, but mostly because it was so close to the large skilled workforce of Swindon's huge GWR factory. With the first planes to be built at South Marston due to be made from wood, the skills of craftsmen from the carriage and wagon shops were to prove vital. Many of the workers arrived via the Swindon and Highworth Light Railway. This was originally built to take railway employees from the Highworth area to Swindon, but a specially built new branch to South Marston meant that some of these workers would now be going in the opposite direction. South Marston was to shadow the Phillips and Powis Aircraft Ltd factory at Woodley, near Reading - and by 1940 some of the production of a training plane called the Miles Master was transferred to the new South Marston site. Building work on the factory at South Marston began in January 1940, but a hasty change of plan was ordered by government officials when they saw the size of the building that was taking shape. They felt that it presented too big a target to enemy bombers, so units were set up at Sevenhampton and Blunsdon instead. The South Marston factory was ready by the summer of 1940 - just as the RAF was about to fight and win the Battle of Britain. By the following spring, the first South Marston Master had rolled off the production line and a year later the factory was turning out nearly 80 a month. In all, over a thousand Masters would be produced at South Marston - and the aircraft was to prove one of the unsung heroes of the war. Many Spitfire and Hurricane pilots learned their trade in a Master, while a number of other air forces also used them, and some were to see active service as glider tugs. But it was as an effective trainer that the plane really made its mark. Some Masters could almost match the speed of early Spitfires and Hurricanes and are an important milestone in RAF history because they were the first high-powered monoplane trainers with similar handling characteristics to the new fighters. They also had the same 'goodies', such as retractable undercarriages, flaps and variable pitch propellors. At the same time as Masters were being produced at South Marston, the area also found itself helping with the manufacture of other aircraft. Men at Swindon's giant Railway Works machined 171,000 components and carried out some timber airframe refurbishment for Hawker Hurricanes, while Marine Mountings (later Lister and Petter or RA Lister), at Wroughton, and Plessey, in Swindon, were also involved in producing components for the war effort. The area was also about to put together whole bombers. In August 1940, the Short Brothers Ltd factory at Rochester was bombed and put out of action, and when the Belfast factory was also attacked, the Ministry of Aircraft Production (MAP) switched much of the Short Stirling manufacturing to the Swindon area. Fuselages were built at Blunsdon and fitted out at Sevenhampton, while parts, including wings, were also manufactured in No. 24 Shop in Swindon Railway Works (in buildings now owned by Clares Retail Equipment Ltd, at North Star) and at a garage in the town centre (later to become Skurray's). These parts were all taken to South Marston, which also produced some of the wings, for assembly in a new purpose-built factory, called FS2. Take-off and landing facilities were also needed for the four-engined Stirling, so two 1,000-yard concrete runways were constructed close to the FS2 site. These were painted with woodchips dipped in camouflage paint, while sections of hedges were also put together to be spread across the runway when not in use, and complete the deception. The first Stirling took off for delivery to the RAF at the beginning of 1942 and soon the factory was completing 16 a month. Between the autumn of 1942 and the spring of 1943, however, production of both the Master and the Stirling was wound down. The intention was to produce Lancaster bombers instead, but plans were shelved as the factory prepared to play host to the world's most celebrated military aircraft. First the factory undertook modification work on US aircraft, but demand for the new generation of Spitfires - the Mark 21 - became so great that South Marston turned all of its production facilities over to these most famous of fighters. Control of the factory duly passed from Phillips and Powis to Supermarine, with South Marston now becoming the shadow factory of the famous Castle Bromwich site in the Midlands and the original Supermarine factory in Southampton (which was extensively damaged by bombing in 1940) where RJ Mitchell designed and tested the original plane. 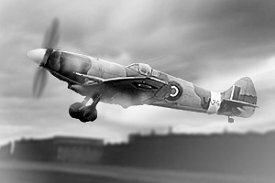 Much of the workforce received hasty retraining in metalwork as a result and, at first, the factory only carried out modifications on older Spitfires before the first South Marston-built Mark 21 was delivered to the RAF just before Christmas 1943. 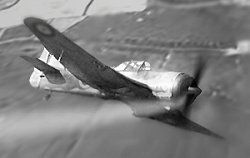 South Marston's role in the Spitfire story, however, was short-lived. The new Spitfire was a high altitude fighter and - especially with D-Day on the horizon in the summer of 1944 - the situation had moved on. In the end, only 121 Mark 21s were built at South Marston, although another 50 modified Spitfires bound for naval action (which the Royal Navy called Seafires) were also made there. Production of later versions of the Spitfire also continued after the war, before South Marston's last Spitfire (actually a Seafire) was completed in January 1949. In October 1945, Vickers bought the factory and airfield from MAP (it cost them £500,000) and the factory's new roles included the modification of planes which had survived the war into trainers. Spitfires also continued to fly out of South Marston after repairs and modifications, with most of these ending up in foreign air forces. Walrus and Sea Otter amphibians were also refurbished - the former destined to fly the colours of the Netherlands and Argentinian air forces, and the latter for civil duties. 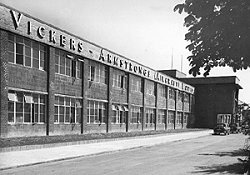 By the 1950s the South Marston factory was part of the Vickers-Armstrongs (Aircraft) Ltd, Supermarine Division. Still the spirit of the Spitfire was proving persistent as production turned to the Attacker, a jet version of the Spiteful, which in turn had evolved from the Spitfire. 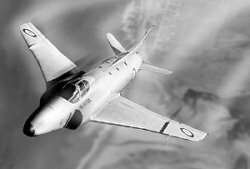 The Attacker was the Royal Navy's first jet fighter designed for launching from aircraft carriers and was also used by the Royal Pakistan Air Force. In all, 182 attackers were built at South Marston between 1950 and 1953. Next off the production line in Swindon was the Supermarine Swift, an RAF fighter that had evolved from the Attacker. 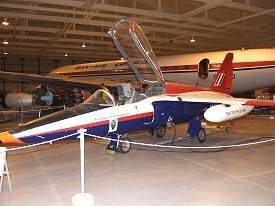 The Swift was a single-seat swept-wing fighter powered by a Rolls-Royce Avon axial-flow turbojet engine. 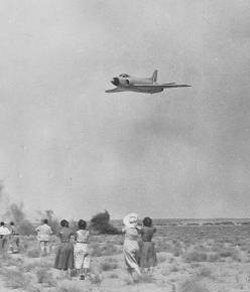 This aircraft was destined for the record books when a South Marston-built Swift F.4 (WK198) set the world speed record at 736mph (32mph short of being the first supersonic aircraft), over Libya, on September 25th, 1953 - a record it held for just eight days. This was the second time that a vehicle made in the Swindon area had held the record - the GWR locomotive City of Truro having set it at 102.3mph in 1904 (see link below). In all, 197 Swifts were manufactured - all of them at South Marston. The factory also produced Scimitar jets for the Royal Navy, and it was to be a Scimitar that would be the final complete aircraft built on the site, in January 1961. Throughout the 1970s and 1980s, South Marston produced components for a wide range of other Vickers products - and major projects such as Concorde. 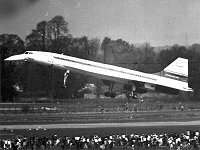 Swindon has a long association with Concorde - beginning with its first ever flight which brought the first prototype to nearby RAF Fairford, then, and still, the longest runway in Europe (the site of its official test centre) and into our airpace in 1969. There it became a familiar sight over our skies, as it landed and took-off nearly everyday during a five year test programme before finally entering service in 1976. In that time, local companies played a huge part in its development, with both Vickers and Plessey challenged with designing, manufacturing and engineering many of the futuristic parts and electronics the aircraft required. Slightly more grounded, Vickers also diversified and designed and tested other flying machines - and not always for aircraft. Some parts were for hovercraft, while others - in an ironic twist from when railway workers switched trades to build those first Masters - were components for railway carriages. Throughout this time, Vickers was an important research and development site, with designers at South Marston, for instance, pioneering new freeze-drying processes. The site had one more twist up its sleeve - and ensured that South Marston would have a hand in the production of planes, trains and automobiles during its lifetime. In the mid-1980s, Honda bought the site, adapted the runways to become a test track and made way for its 1.5million sq ft car plant by demolishing the original factory. Happily, the old FS2 building remains, providing commercial, workshop and warehouse accommodation for BSS (Business Space Services), and the Sevenhampton buildings also survive. Although South Marston was the biggest, it was by no means the only wartime and post-war aircraft engineering site in the Swindon area. The building of Wroughton Airfield was planned before the war began - and it was to play a major role in keeping the Allies flying. During the conflict, more than 7,000 aircraft - of no less than 62 different types - were modified, serviced or repaired at Wroughton's maintenance unit (or MU No. 15 as it was known in the RAF). In 1941, another unit, MU No. 76, was also set up at Wroughton to handle the packing of aircraft into huge crates for transport overseas. Wroughton also became the final assembly point, in the second half of 1943, for many of the gliders that were to play a key role in the liberation of Europe the following summer. Made from wood, they arrived in sections from furniture and cabinet makers across the country and were assembled, flight-tested and then despatched from Wroughton's three runways during the build-up to D-Day. On the eve of the invasion, nearly 600 aircraft were on site - but if it was to herald the beginning of the end for the Nazi empire, Wroughton still had a bright future. De-mobbed Lancaster bombers were sent there - most to be scrapped - while work continued on Avro Lincoln and Meteor jets. In 1953, the first of many Canberra bombers arrived, and Wroughton was to provide support for this aircraft throughout the next 19 years. Mosquitoes and more Lancasters made their last flights to Wroughton during the 1950s, usually destined for the scrapheap, but one Lancaster - PA474 - came in for an overhaul in 1964, ready to join the Battle of Britain Memorial Flight, of which it is still a member. The 1960s even saw work on Westland helicopters at Wroughton, but by 1972 its life as a maintenance unit was over. Still the site proved resilient - and found that it had a long-term future that was rooted in the past, when, in 1978, the Science Museum unveiled Wroughton as the store for its aircraft collection and other large exhibits. 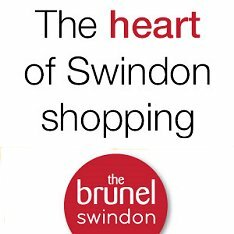 It should provide new generations of local folk with just a flavour of their rich and proud aircraft heritage - and there can be no denying the key role that previous generations from Swindon and the surrounding area played in what history now calls 'our finest hour'. 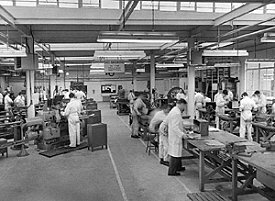 Aircraft manufacture and engineering also proved to be a crucial chapter in the history of Swindon. The diversification away from the railways and the establishment of new skills, new industries and new employers made possible the post-War development of the town - not to mention its long-term success. For many years, a preserved South Marston-built Spitfire was on display outside the Vickers factory. This was a Mark 21, LA226, which returned in 1968, shortly after it was used in the movie, Battle of Britain. It remained there until 1984 and is currently stored, dismantled, in the RAF Museum Store at Cosford. The Short Stirling was the tallest and longest plane to fly with the RAF during the Second World War, but was superseded by the Lancaster and the Halifax. Sadly, no Stirlings were preserved and none exist today. Even the original drawings have gone, destroyed in a fire. Many of Swindon's railways workers were in reserved occupations, which meant that they were exempt from active service during the Second World War - but that didn't necessarily mean they remained in Swindon for the duration. As well as being sent to work at South Marston, Blunsdon, Sevenhampton or Wroughton, others were also despatched to other aircraft factories in cities such as Southampton. At least three South Marston-built Spitfires are currently on display - but none of them are airworthy: LA198, a Mark 21, built in 1944, is at the Museum of Transport, Glasgow (see www.glasgowmuseums.com). It is due to remain there until it is moved to the Kelvingrove Art Gallery, also in Glasgow, in early 2006. PK683, a Mark 24, built in 1946, can be seen at the Southampton Hall of Aviation (see www.spitfireonline.co.uk), which is also home to a Supermarine Scimitar and the Supermarine archives. VN485, a Mark 24, built in 1947, was the 11th from last Spitfire to be delivered to the RAF. It is now at the Imperial War Museum, Duxford. A typical South Marston Spitfire had a wingspan of 36ft 11 inches and was 32 ft 8 inches long. It had a top speed of 450mph at 19,000ft - 520mph when diving. It could fly to a maximum of 43,000ft and had a range of 580 miles - 965 miles if fitted with an additional fuel tank. The world record-breaking Swift, WK198, can be seen at the North East Aircraft Museum, Sunderland (see www.neam.co.uk) - but minus its wings. Complete (but not airworthy) Swifts are on display at the Newark Air Museum, Nottinghamshire (see www.newarkairmuseum.co.uk) and Tangmere Military Aviation Museum at Chichester, Sussex (see www.tangmere-museum.org.uk). A preserved Attacker can be seen at the Fleet Air Arm Museum, Yeovilton (see www.fleetairarm.com). Many Canberras survive, including at the RAF Museum, Hendon (see www.rafmuseum.org.uk) and the Imperial War Museum, Duxford (see www.iwm.org.uk/duxford/index.htm). Sadly, no Miles Masters survive today and the closest we have is a replica of a sister plane, the Martinent, and some original components, at the Museum of Berkshire Aviation at Woodley, near Reading (see www.iwm.org.uk/duxford/index.htm for more information about Miles aircraft). South Marston Spitfires are not easy to spot because the plane went through dozens of variations over many years. They are especially difficult to spot on film, but in still pictures, there are some telltale clues that can at least narrow things down. All of those built at South Marston were Mark 21s or later - and these all had propellors with five blades. Seafires, the Naval equivalent of the Spitfire, are usually pictured on aircraft carriers with their wings folded for storage, but South Marston only output versions without folding wings - and, to the untrained eye, these are also more or less indistinguishable from Spitfires. As well as the key aircraft engineering sites, the Swindon area also played host to important operational airfields. Blakehill Farm, near Cricklade, Wanborough, Clyffe Pypard and, of course, Lyneham, all saw active service. No bombs fell on any of the aircraft manufacturing facilities in the area during the war - and the Swindon area as a whole was relatively untroubled by the Luftwaffe (especially compared with similar towns) throughout the war. The name Supermarine still lives on in Swindon in the name of two major sports clubs in the town. Both Supermarine Rugby Club and Football Club still play on pitches that were once part of the Vickers Armstong site, and were born out of the sports and social club that thrived during the heyday of the main factory until it closed in the early 80s. (see www.supermarinefc.com and www.supermarinerugby.co.uk for more information).